Vermont’s tireless and best-placed advocate in the Nation’s Capital, Patrick Leahy is the most senior member of the U.S. Senate -- where seniority counts -- giving Vermonters not only a voice but a front-row seat at the table when key decisions are made. That has included when times were tough such as when Hurricane Irene devastated parts of Vermont in August, 2011. The epic storm required an historic federal relief effort that totaled over half a billion dollars. He is a tireless promoter of the Vermont business community working closely with Vermonters to promote job growth and expand markets overseas. He provided the initial funding of the most successful technology incubator in Vermont, the Vermont Center for Emerging Technologies (VCET). The son of a printer and the grandson of stone cutters, born in Montpelier, raised across the street from the State House, and schooled in Montpelier and Colchester, Patrick Leahy has spent most of his adult life working for Vermonters. He knows and he appreciates what makes Vermont a great place to live, work and raise families, and he carries those values throughout his wide-ranging efforts to expand opportunity and the quality of life in Vermont. He was the first on either side of his family to attend college. After graduating from Saint Michael's College in 1961 he earned his law degree from Georgetown University Law Center in 1964. Then he returned home to Vermont to the private practice of law. For eight years after that, he served as the State's Attorney in Chittenden County, where he earned a national reputation for his law enforcement work. In 1974 he became the first Democrat who Vermonters ever elected to the United States Senate, where he is now the Senate’s longest serving member. He serves as the Vice Chair of the Senate Appropriations Committee and is also the senior-most member of both the Senate Judiciary Committee and the Senate Agriculture Committee. Patrick Leahy has always worked to infuse Vermont values into U.S. foreign policy and has been a champion of international human rights. He has long been a leader in the U.S. and international campaign to ban anti-personnel landmines writing the world's first law to ban the export of these indiscriminate weapons. Offering help and hope to the innocent victims of war, he led congressional efforts to create ongoing practical support through a program his colleagues later renamed The Leahy War Victims Fund, which provides up to $12 million a year for humanitarian work in clinics in war-torn countries across the globe. He has also long advocated changes in 50 years of failed U.S. policy on Cuba, including ending the ban on Americans’ travel to Cuba. On Dec. 17, 2014, President Obama sent Patrick Leahy at the head of a delegation to Havana to bring home Alan Gross, after 5 years of imprisonment. As the chairman or ranking member of the Judiciary Committee, Senator Leahy has authored, advocated and enacted a wide range of anti-crime and anti-drug initiatives. He wrote the charter for the current federal grant program for the nation's first responders, and his all-state minimum for the program's formula has brought millions of federal equipment dollars to Vermont's police, fire and EMS units. He has worked tirelessly to help Vermont communities and local law enforcement to address rural drug and alcohol addiction. He recently authored and successfully passed a reauthorization of the Violence Against Women Act that included an expansion of programs to ensure that all victims regardless of their gender or sexual identity have access to these important programs. In his Judiciary Committee role, Patrick Leahy also gives Vermonters a leading voice in confirming nominations to the Supreme Court and other federal courts. He knows that America’s independent judiciary is the envy of the world, and he fights to keep it independent. 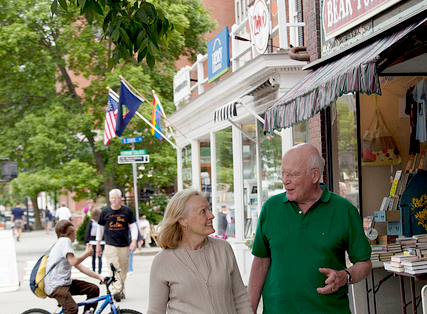 A longtime leader in efforts to reform the death penalty, Patrick Leahy is the author of the Innocence Protection Act, bipartisan reforms in the use of the death penalty that help ensure access to competent legal counsel and by allowing post-conviction DNA testing to reduce the possibility of executing innocent individuals, while raising the possibility of finding the real criminals. As the most senior member of the Agriculture Committee he has long led on dairy policy. He has authored several key conservation programs that have helped forge working partnerships between farmers and vital environmental and conservation goals, drawing from Vermont’s experience and ethic of environmental stewardship. He is the “father” of the highly successful national organic standards and labeling program, and the Leahy charter for U.S. organic agriculture has helped the organic sector thrive to become a $39 billion-a-year sector of the American economy. Patrick Leahy has championed effective child nutrition and anti-hunger programs, gaining bipartisan support for addressing the nation's obesity crisis and leading efforts to implement hands-on nutrition education programs in the nation’s schools. He has led in forging congressional partnerships with communities in Vermont and states around the country in the successful and growing Farm To School movement. Drawing on his Green Mountain heritage, he is one of the Senate's leading advocates of forest conservation, clean water and clean air policies, and sound environmental stewardship. He opposed the Keystone pipeline, has fought Republican efforts to open the pristine Arctic National Wildlife Refuge in Alaska to oil drilling, and has supported efforts to drill in the Missisquoi Wildlife Refuge in Vermont. He has worked to protect and enlarge the Green Mountain National Forest, which has expanded by nearly 150,000 acres during his Senate service. He led efforts to tackle the health dangers of mercury pollution, and year after year he leads in securing federal partnership support for cleaning his beloved Lake Champlain, “the Jewel of New England.” He has secured crucial funding that has helped enliven and conserve the character and culture of downtown business districts in several Vermont communities. He is the co-chair of the Senate's 75-member National Guard Caucus, and he has won enactment of several of his “Guard Empowerment” reforms, including adding the Guard to representation on the Joint Chiefs of Staff. He has fought to improve access to health care, education and retirement benefits for Vermont's citizen-soldiers and to make sure that they are treated equally with the active forces. In recognition of his service to our men and women in uniform, Senator Leahy has been awarded the George Washington Freedom Award from the Adjutants General of the U.S. Association, the Eagle Award from the Enlisted National Guard Association, and the Harry S. Truman Award for "sustained contributions of exceptional and far-reaching magnitude to the defense and security of the United States in a manner worthy of recognition at the national level." Sometimes referred to as the "cyber senator" for his enthusiasm for and leadership on technology and digital issues, Patrick Leahy was the second senator to post an official homepage on the internet and the first to start a blog. Since its creation in 1995, the Leahy Senate website – and his use of his social media sites -- have often won awards as one of the Senate's best. His interest in technology also led him to co-found the Congressional Internet Caucus, which he co-chairs, and to spearhead efforts to expand broadband access to Vermont. Mindful of new hazards presented by the internet, he is also a leader in the effort to protect intellectual property rights and privacy. He has methodically built wide bipartisan support for his reforms to end NSA’s dragnet collection of Americans’ telephone communications – his USA FREEDOM Act – as well as for his bipartisan email privacy legislation. Patrick and Marcelle Leahy live on a tree farm in Middlesex and have been married since 1962. Marcelle is a Registered Nurse who has worked in Vermont, Virginia and the District of Columbia. Most recently she worked as a staff nurse in the Medical-Surgical Unit of Arlington Hospital in northern Virginia. She is now a member of the Advisory Board of the University of Vermont College of Nursing and Health Sciences. Marcelle Leahy is also the honorary chair of the Vermont National Guard Family Support Program, which helps ensure that the families of the state's citizen-soldiers receive the assistance and care they need during lengthy deployments of their loved ones. The Leahys have two sons, a daughter, two daughters-in-law, a son-in-law, and five grandchildren. Patrick Leahy's Legacy of Fighting for Human Rights, Dan D'Ambrosio, Burlington Free Press, 3/6/2016. Sen. Leahy Remains A Workhorse After Four Decades In D.C. Paid for by Leahy for U.S. Senator Committee, Inc.